Death comes to us all, but it’s how we live right up to that very final moment that can often show our true character. Private Eddie Slovik (left), the only GI to be executed by his own side in World War II (and of whom I’ve written before), raged at his imminent demise in the minutes before they strapped him to a post to kill him. ‘I used to steal things when I was a kid, and that’s what they are shooting me for. They’re shooting me for the bread and chewing gum I stole when I was 12 years old. Eddie was killed because he was a deserter, but he had never gone on the run, instead he had handed himself in and simply stated that he preferred prison to battle. That wish was denied him and, on January 31, 1945, he was executed by firing squad. Who can blame his anger at the injustice of it all? Others have taken a more sanguine approach to imminent death. 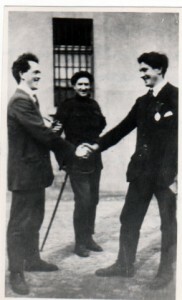 In 1922, Erskine Childers (right) was executed in Beggars Bush Barracks by the Free State Army during the Irish Civil War. Childers was an historian and author of the acclaimed The Riddle of The Sands (a book I loved to read as a boy). In 1914, almost a hundred years ago to the day, he famously brought a shipload of weapons from Germany to Irish nationalists on board his boat, the Asgard. It was a pivotal act in Irish history and formed the basis of the armed struggle against British power. Later, he was part of the delegation that traveled to London with Michael Collins to negotiate a treaty with the British. He later broke with Collins on the issue and supported the IRA nationalists who fought the Free State. When Collins was killed, emergency laws were brought in ordering the death sentence for anyone caught with unauthorised weapons. Childers was arrested in early November with a small sidearm — a gun that had actually been given to him by Michael Collins as a gift back when they were on the same side. The Free State wanted vengeance for Collins and so Childers paid the ultimate price. But Childers himself wasn’t one for revenge. On the eve of his death he asked to speak to his sixteen year-old son (also Erskine, who would one day become President of Ireland). Erskine senior made his son promise that he would seek out every one who had signed his death warrant… and shake their hands. The following day he was was shot at the Beggar’s Bush Barracks in Dublin. As he stood there, facing all those rifle barrels, he said one more thing to the men about to kill him. My grandfather was one of those who pulled the trigger. He never spoke much about it, only telling my father that it was a bad business. Others have faced death in similar fashion. A remarkable series of photographs show IRA Volunteers Paddy Moran and Thomas Whelan (left) about to be executed by the British in Mountjoy Jail in 1921. The men were sentenced to die for their parts in the assassination of British intelligence officers on what became known as ‘Bloody Sunday’. They are pictured posing happily with their captors. In one photograph, Whelan even has his arm around one British officer. A few minutes later both prisoners were hanged. In World War I, German spy Karl Lody (below right) showed his mettle when he was in the Tower of London awaiting death. Born in Berlin in 1877, Lody graduated as a captain from the Maritime Academy in Geestemünde in 1904, but became ill and was never able to take up the post. He married an American. Under a forged U.S. passport he traveled Europe, speaking English with an American accent. When war broke out, German intelligence thought he would be useful and sent him to spy on the British naval base at Rosyth, in Scotland. Lody was eventually tracked due to his own carelessness – he stopped encrypting his messages and even wrote them in German. He was tried and sentenced to death. So impressed was Lody by them, that he even left a sixpence tip to show his gratitude. The guards, apparently, found it all a difficult business… but they still managed to take him out and kill him. We are strange, strange creatures. Stories such as these only reinforce the pride and shame we feel in our own humanity, leaving us with the faint hope that, come the day, we too might meet our Maker with such grace and fortitude. Wow, David. And I laughed as I read Childers line, “Take a step forward, lads. It will be easier that way.” Who but an Irishman would deliver this line? Thank you for this. I am a huge fan of your writing. Thanks again Claire, and thanks for encouraging me to join The Wild Geese. It's a great site. David, thanks for this perspective! Lody was captured in the Great Southern Hotel in Killarney, I see, another Irish connection that I'd love to see made in the story itself. I'd also enjoy reading more about your grandfather's story, as a Free State soldier and as an Irishman. Thanks for the information on Lody, Gerry.. I have a little bit of information on my grandad, but not loads. I'll try to work in what I have to another article in the future. Another interesting figure, with many Galway connections, who faced a British hangman was William Joyce, aka "Lord Haw-Haw." I had thought of including him but discounted it as he was American-born. I didn't know about the Galway link. I think I might include him in a post in the future ... ;you're giving me plenty to write about!